To a degree, Robson’s gross underestimation of Cameroon’s quality can slightly be understood. You only have to look to the 4-0 defeat to the USSR two games before. Then there was the fact they couldn’t get beyond the first round of the Cup of African Nations a few months before. Cameroon were seemingly undercut by both indiscipline, as illustrated by the two red cards against Argentina, and inefficiency – as emphasised by Francois Omam-Biyick in that quarter-final. With the goal and the game at his mercy in the closing stages, the number-seven opted to ludicrously back-heel the ball rather than shoot. But it shouldn’t be forgotten that moment came towards the end of a match in which Cameroon’s refreshingly ambitious football had eviscerated England repeatedly. One move early on saw Louis Mfede theatrically take Des Walker out of the game by leaping five feet into the air and allowing the ball to run under him to the unmarked Omam-Biyick. In a desperately dull tournament, they were a revelation. But they were also effective. Most memorably, they had beaten the champions Argentina in the opening game. That eventually helped them top a testing group which also featured Romania. The defeat to the USSR was a dead rubber. What’s more, they had already conquered Africa in 1988 thanks to the astute management of Claude Le Roy. It’s that fact, allied to their World Cup performance, which puts them ahead of so many bridesmaids like Portugal 1965-67, Portugal 2004-06, Holland 1998-2000 and Sweden 1957-59. Because they combined a global breakthrough with continental conquest, this Cameroon remain Africa’s greatest ever team. And they could certainly play. A team that pretty much prove the knife-edge nature of international football. Before Poland travelled to Wembley for their crunch World Cup qualifier in 1973, goalkeeper Jan Tomaszewski said “I would give five years of my life not to be humiliated”. By the end of a 1-1 draw in which the keeper had performed outright wonders, Peter Shilton bitterly remarked that his opposite number had been “haphazard, wildly eccentric and downright lucky”. Cut forward eight months, then, and note the contrast. Poland seemed to have the complete measure of hosts West Germany in a play-off for the final, only for a relentless rainstorm to interrupt their fluid football. Essentially weather-beaten, Poland were later described by Paul Breitner as “by far the best team in the tournament”. Such a difference probably emphasises the huge effect of momentum and belief over the international football’s intermittent fixtures. As Tomaszewski told Jonathon Wilson, “after Wembley, everything was different”. Whatever the truth of that, Poland at least had all the pieces in place. With coach Kazimierz Gorski providing revolutionary man-management and assistant Jacek Gmoch offering evolutionary tactical thinking, a brilliant core of players were allowed to flourish. That same nucleus, after all, had already won Olympic gold in 1972 before Wembley. And they almost had enough to claim the greatest prize of all. The best team never to win the World Cup. The most entertaining team of all time. The ultimate in futebol de arte. That unforgettable Brazilian team of 1982 went by many titles – but never actually won any. With a magic attacking midfield quartet of Cerezo, Falcao, Socrates and Zico, Brazil could be a match for anyone when on song. And usually in magnificent fashion. They scored an average of three goals game in 1982, almost all of the 15 exquisite. As sensational as their football was, however, it was unfortunate to come at a time of dramatic change in the game. As outlined in Inverting the Pyramid, their elimination to Italy – and Paolo Rossi – “was the day after which it was no longer possible simply to pick the best players and allow them to get on with it; it was the day that the system won”. Without one, Santana’s Brazil at least had the individuals to be wondrous. But it’s also no wonder why that core never won any of the three trophies they entered. Football came home alright. To the European country with the greatest record of success. And, although this was far from the most dynamic German side, it was exceptionally dependable. Berti Vogts’s team only lost two out of 41 games in the two years surrounding that Euro 96 victory. In truth, of course, that period was out of synch with the perpetual crisis that was the ’90s for Germany football. But there was also a very clear reason for that. In January 1995, Lothar Matthaus tore his achilles tendon. Matthias Sammer took his place at libero and everything seemed to click. As Uli Hesse wrote in Tor!, “Matthaus had lost his place in the side to a better player and a man much more beneficial to team spirit”. That was undoubtedly what the team had, as they overcame a series of injuries and interruptions to assuredly claim Euro 96. Despite missing Jurgen Kohler, Mario Basler and Jurgen Klinsmann for various stages of the tournament, as well as Andreas Moller for the final, their sweeper swept them along to the final. Ultimately though, they couldn’t overcome his knee problems. In August 1996, Sammer underwent an operation to rectify the problem and never truly recovered. With him went Germany’s chances for a new generation. The culmination of Catenaccio. So committed was coach Ferruccio Valcareggi to his cautious system that he refused to fit his two idolised playmakers – Sandro Mazzola and Gianni Rivera – into the same team, eventually using one per half in the infamous Staffetta policy. 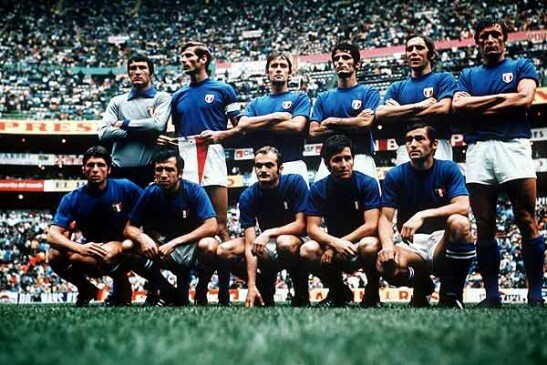 Such order, however, brought Italy the Euro 68 title and to the 1970 World Cup final. The fault-line in history was clear though. By the 90th minute of the semi-final, their cast-iron defence of Cagliari-Inter players had only conceded a solitary goal in six games. Then Karl-Heinz Schnellinger equalised and hell both froze over and broke loose at the same. Italy utterly abandoned their defensive approach in extra-time and the resulting 4-3 victory has been described as the greatest game of all time. Whether that’s accurate or not, it was probably a factor in one of the greatest performances of all time. With the Italians shattered, Brazil exploited every flaw to render Catenaccio irrelevant. To be fair, they had taken it some distance.